INVESTIGATIONS into Low Taek Jho’s role in the multibillion-ringgit scam at 1Malaysia Development Bhd (1MDB) and SRC International have resumed after three years. The Malaysian Anti-Corruption Commission (MACC) wants Jho Low and Nik Faisal Ariff Kamil to come home from wherever they have been hiding. Meantime, Singapore has disclosed that arrest warrants have been issued for Jho Low and his sidekick Eric Tan Kim Loong for money laundering activities. Despite being the subject of worldwide scorn and probes since the US Department of Justice (DoJ) initiated civil proceedings to recover around US$3.5 billion in stolen 1MDB money in 2016, Jho Low has not been inactive. Indeed, he was planning and executing billion-ringgit deals right up to just before the May 9 general election that saw the ouster of former prime minister Datuk Seri Najib Razak’s coalition. We piece together some of these deals in our cover story. In 2015, The Edge published several exposés on how Low Taek Jho, together with Tarek Obaid and Patrick Mahony of PetroSaudi International, had used US$260 million that came from 1MDB to partly finance the RM1.4 billion takeover of UBG Bhd in 2010. Prior to the takeover, Jho Low had, in August 2007, taken a 49% stake in the then listed Putrajaya Perdana Bhd (PPB) for RM198 million from E&O Bhd and in November, had bought a 45% stake in Loh & Loh Corp Bhd for RM111 million. The principal vehicle used by Jho Low was Abu Dhabi Kuwait Malaysia Investment Corp (ADKMIC). The total acquisition cost was RM309 million. Within just a few months, Jho Low had made a quick flip and sold the stakes in the two companies to UBG in January 2008 for RM456 million cash or a whopping profit of RM147 million. The PPB stake was valued at RM332 million while Loh & Loh was tagged at RM124 million. In July 2008, UBG spent another RM343 million and RM205 million on buying the remaining stakes in PPB and Loh & Loh. By then, Jho Low had become a substantial shareholder of UBG, which was controlled by the family of Tun Abdul Taib Mahmud, the then chief minister of Sarawak, via Cahya Mata Sarawak Bhd (CMS). Jho Low and Taib became partners in UBG by virtue of the former, using Majestic Masterpiece Sdn Bhd, having taken up 183 million UBG shares at RM2.50 apiece via a special issue in January 2008. In May the same year, UBG subscribed for a 51% stake in Unity Capital International (Cayman) Ltd, an asset management company with which UBG later placed RM350 million to manage. In 2011, UBG wrote off RM250 million of the investment placed with Unity Capital, which was, not surprisingly, controlled by Jho Low. Unity Capital was managed by one Ian Tham and at the time, Jho Low had his other sidekicks from Penang, like Geh Choh Hun and Tan Vern Tact, actively involved as directors of some of these companies. But after UBG went on a spending spree of around RM1.35 billion through the various deals initiated by Jho Low, relations with the Taib family deteriorated. Before the partnership had started, UBG had around RM2.23 billion cash from the sale of its stake in RHB Bank. Taib’s family felt UBG had overpaid for the assets bought from Jho Low and the promised multibillion-ringgit contracts and returns UBG was to get in return never materialised. It was then decided that Jho Low and his PetroSaudi cohorts, via Javace Sdn Bhd, would make a general offer for all of UBG, offering the Taib family an exit. But by then, relations were so bad that when Mahony was in Kuala Lumpur in January 2010 to arrange for a RM700 million AmBank loan to part-finance the takeover of UBG, he avoided CMS executives who wanted a meeting. CMS had emailed Mahony, asking him to meet its deputy chairman Datuk Abu Bekir Taib and executive director Datuk Syed Ahmad Alwee Asree. Bekir is Taib’s son while Syed Ahmad is his son-in-law. In December 2010, Jho Low took UBG private while CMS exited with RM456 million cash. Over the next two years, he delisted UBG, PPB and Loh & Loh. He then went on to “sell” PPB to Cendana Destini Sdn Bhd for RM260 million and Loh & Loh to Selesa Produktif Sdn Bhd for RM320 million. Although his name does not appear in Cendana and Selesa, Jho Low is still believed to be behind PPB and Loh & Loh. 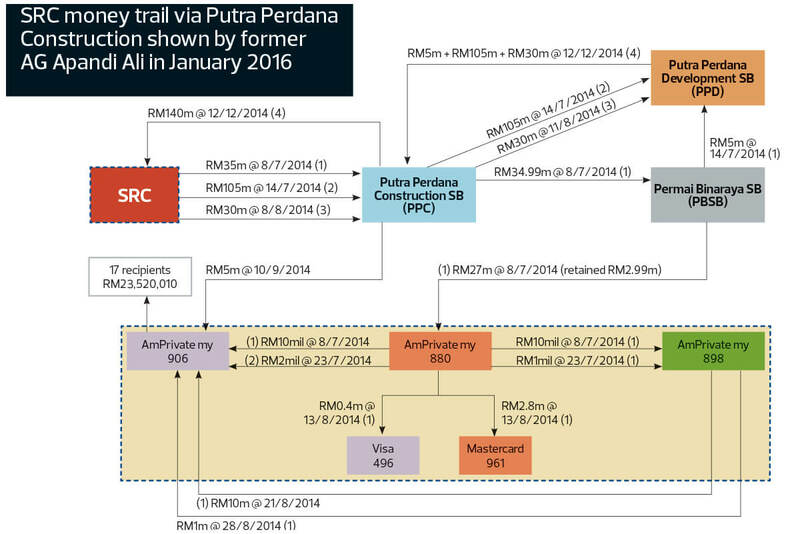 Remember the money flow charts waved under the noses of reporters by former attorney-general Tan Sri Mohamed Apandi Ali in January 2016? Yes, the very same charts he used to clear former prime minister Datuk Seri Najib Razak of any wrongdoing with regard to 1MDB-linked funds that landed in his personal bank accounts. 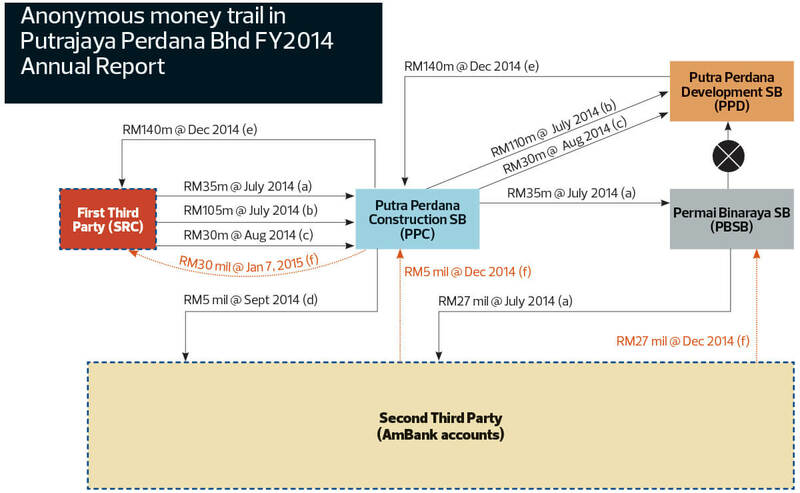 A closer look at the financial records of the companies shown on Apandi’s “SRC Money Trail via Putra Perdana Construction” charts revealed a similar record of “fund movements” in notes to the FY2014 audited accounts of PPB. In the audited accounts, PPB chose to identify the counter parties to the fund transfers only as “first third party” and “second third party”. The notes to the accounts did not say what PPB’s relationship with these two third parties was or the reason the funds were transferred between their bank accounts. It is worth noting that PPB’s FY2014 accounts were signed off by external auditor Moore Stephens Associates on May 4, 2016 — some 16 months after the financial year ended and barely two months before signing off PPB’s FY2015 audited accounts on June 28. Both sets of accounts were tabled at PPB’s annual general meeting held on June 30. Moore Stephens noted that PPB’s previous auditor (KPMG, which was also 1MDB’s auditor for FY2010-FY2012) had on April 22, 2014, “expressed an unmodified opinion” on the FY2013 financial statements tabled at PPB’s AGM on June 10, 2014. Moore Stephens’ partner Lo Kuan Che, who signed off PPB’s FY2014 and FY2015 accounts, declined comment on why the identity of the first and second third parties was not revealed by PPB and whether the auditor was given sufficient proof that the fund transfers were not out of the ordinary or if it knew the reason why KPMG did not stay on as the auditor. “We are bound by our by-laws (on professional ethics, conduct and practice). All client matters are confidential,” Lo tells The Edge via email. At press time, PPB managing director and major shareholder Datuk Rosman Abdullah had yet to reply to emailed questions seeking comment on the identity of the third parties or the company’s link to Jho Low. Though Moore Stephens and PPB declined to explain, by reconciling the information in Apandi’s charts with that of PPB’s audited accounts, it is not difficult to conclude that the first third party is SRC International and the second third party is the holder of AmPrivate Banking account number ending 880 (2112022011880), that is Najib. July 8, 2014. Most (RM34.99 million) of the money from SRC then went to PPC’s wholly-owned subsidiary Permai Binaraya Sdn Bhd (PBSB), which retained RM2.99 million and moved RM27 million to Najib’s AmPrivate Banking 1MY account number ending 880. The same money trail was recorded in Note 17.2 (a) of PPB’s FY2014 financial statements, which recapped fund movements in the group’s bank accounts — save for the fact that SRC is referred to as first third party while account 880 is second third party. The notes do not explain why the fund transfers took place. Note 17.2 (b) of the audited accounts show PPC getting another RM105 million from the first third party (SRC) in July 2014, which was immediately followed by a RM110 million transfer by PPC to sister company Putra Perdana Development Sdn Bhd (PPD), another of PPB’s wholly-owned subsidiaries. In August 2014, PPC received another RM30 million from SRC, which it transferred to PPD. That brought the total PPC received from SRC to RM170 million. In September 2014, PPC advanced another RM5 million to the second third party (Najib), the notes to the accounts read, bringing the total funds transferred to this party to RM32 million. The fund flow reversed about five months later in December 2014 when PPC received RM140 million from PPD, which it used to repay the first third party (SRC). “PPC and PBSB received funds amounting to RM5 million and RM27 million in December 2014 respectively as repayment of the amounts advanced to the second third party,” says Note 17.2 (f), which does not specify where the money came from. By Jan 7, 2015, the remaining RM30 million owed to the first third party (SRC) had been repaid, according to subsequent notes to PPB’s FY2014 financial statements. What were the bank transfers for? To understand why Jho Low had to arrange for the transfers of money between SRC and PPB, we took a look at PPB’s cash position and what it did in 2014. At the end of FY2013, PPB had cash of RM129.1 million. In March 2014, it acquired a 37.5% stake in Iskandar Holdings Co Ltd from Unity Capital for RM240 million cash. Iskandar Holdings, which owned land in Iskandar, Johor, and Unity Capital are also controlled by Jho Low. It appears that PPB had to “borrow” money from SRC to finance the acquisition of Iskandar Holdings. Between July and August 2014, SRC transferred RM170 million to PPC, virtually a bridging loan to PPC/PPB. In December 2014, PPC/PPB returned to SRC only RM140 million of the RM170 million it had received. One can conclude here that the remaining RM30 million was part of the RM32 million (RM27 million in July via Permai Binaraya, and RM5 million in September) that PPC/PPB had transferred to Najib’s personal account at AmPrivate Banking. This transfer of money that originated in SRC is now the subject of MACC investigations against Najib. Investigators should also be asking why SRC, once a subsidiary of 1MDB and then directly owned by the Ministry of Finance (MoF), was lending money to a privately owned company like PPB? It should also be noted that the CEO of SRC at the time was none other than Nik Faisal Ariff Kamil — a key Jho Low operator who also managed all the bank accounts of Najib at AmBank. On June 7, MACC issued a notice to look for both Jho Low and Nik Faisal. When announcing two suspicious “red file” projects totalling RM9.4 billion under MoF’s Suria Strategic Energy Resources Sdn Bhd (SSER) on June 5, Finance Minister Lim Guan Eng told reporters there was “strong suspicion” that they were “all part of the 1MDB scandal”. Lim described the red files as documents pertaining to 1MDB and other sensitive matters that can be accessed by only former MoF secretary-general Tan Sri Irwan Serigar Abdullah and a few others. Even the auditor-general did not have access to the files. It is believed that Jho Low had a hand in the negotiations of SSER’s projects with various Chinese companies as well as that of the RM60 billion East Coast Railway Line (ECRL). The cost of both projects is said to be highly inflated in order for money to be siphoned out for 1MDB-related payments as well as for the benefit of Jho Low. SSER president Datuk Mohammed Azhar Osman Khairuddin was independent non-executive director of PPB from Aug 1, 2013 to Aug 12, 2014. An associate of Jho Low and former investment director at 1MDB, Jerome Lee Tak Loong, was appointed independent non-executive director of PPB on March 28, 2014, but resigned on Oct 19, 2015, filings with the Companies Commission of Malaysia (CCM) show. He met the executives of Malaysian construction companies and told them those who wanted to bid for ECRL jobs had to go through him. Lee’s father-in-law Datuk Koay Teng Keong is understood to be the Malaysian adviser to China Communications Construction Co Ltd (CCCC), the Chinese contractor for the ECRL. The ECRL contract comes with a clause requiring CCCC to nominate a company unrelated to it to buy 70% of PPB for US$244 million as well as 90% of Loh & Loh for US$71 million. Both companies are linked to Jho Low. In July 2015, Lee and PPB’s Rosman were among those remanded by MACC, which was investigating some RM42 million that had flowed from SRC into three AmBank accounts that belonged to Najib. The MACC probe was stalled when former attorney-general Tan Sri Gani Patail was replaced on July 25, 2015, and those leading investigations at MACC were questioned in August 2015 and subsequently transferred out or retired in July 2016. MACC’s investigations resumed following the outcome of the 14th general election. Last Thursday, it issued a statement seeking to speak to Jho Low and Nik Faisal about its investigation into some RM42 million deposited into the accounts of the former prime minister. Last Tuesday, the finance minister said the contracts for SSER were signed at the same time as the contracts for ECRL by Irwan. Both projects are being financed by loans from China’s Exim Bank. Lim had instructed MoF to investigate SSER and had lodged a report with MACC, adding that the Attorney-General’s Chambers had confirmed that the two SSER contracts were directly negotiated by the Prime Minister’s Office and signed despite “numerous unanswered questions and red flags”. 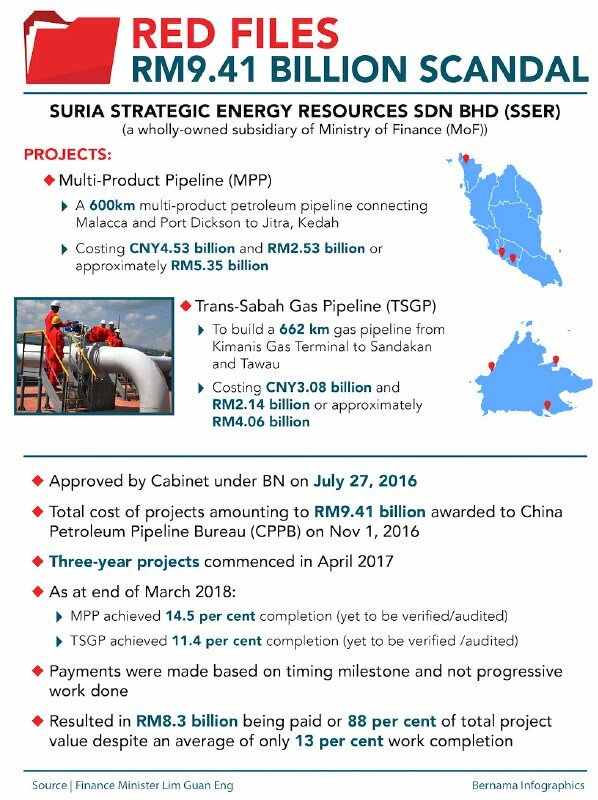 Apart from the RM9.4 billion expenditure for the two gas pipeline projects awarded to Chinese firm China Petroleum Pipeline Bureau (CPPB) on Nov 1, 2016, there is another RM1 billion of consultancy and maintenance agreement for three companies from China. What was shocking about the terms of the contract was that while only 13% of work has been completed, SSER has already paid CPPB some RM8.3 billion or 88% of the project’s cost — all within a year of the commencement of work in April 2017. “The ECRL contract is strange,” Prime Minister Tun Dr Mahathir Mohamad told The Edge in a recent interview. “The contractor must be from China. And the money is not supposed to come here but [kept abroad] to pay the contractor in China.” He confirmed that there are suspicions that some money paid for ECRL was to be used to retire 1MDB debts and to buy certain companies. Mahathir’s administration is seeking to renegotiate the terms of the RM60 billion ECRL contract with the various Chinese parties. Malaysia would need to pay RM22 billion in compensation and penalty if it were to scrap the ECRL project, a move that would also trigger a default of the Exim Bank loan taken to fund 85% of the rail project, The Malaysian Insight reported last Thursday. About RM20 billion (33% of the RM60 billion) has been paid for the ECRL, although only 15% of the work has been completed. The ECRL and SSER contracts are other examples of lopsided agreements put together for Malaysia by Jho Low with the sanction of top MoF officials under the previous government. Remember how US$700 million was moved to Good Star Ltd, a company owned by Jho Low, just two days after 1MDB remitted US$1.0 billion for the 2009 joint venture with PetroSaudi? Or how RM4.25 billion or 38% of the RM11.55 billion raised from two bond issues in 2012 was immediately sent to Aabar Investments PJS as a security deposit and is now a subject of dispute between Malaysia and Abu Dhabi?